Die-Cut Sales Brochure - Flottman Company. Create a sales brochure that is interesting and engaging. 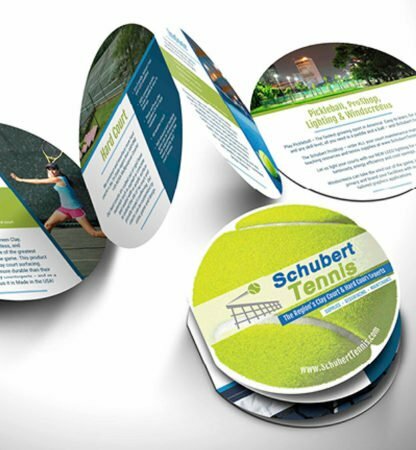 Create a die-cut brochure in the shape of a tennis ball to reflect our client’s services. Our client loved the new brochure, and it has proved to be an effective sales tool for his business. This die-cut brochure was created as a sales tool for a client that designs and builds tennis courts. The piece was part of our larger rebranding project for the company. We wanted to create a brochure that clients and potential customers would actually want to read and that matched the bright, high-energy image we were creating for the company. We replaced the bulky, outdated sales brochure they had been using with this unique and visually captivating piece. By condensing the information into a multi-folded brochure, we were able to create a much smaller piece that can easily fit in a pocket or purse. This size is more convenient to hand out during sales meetings or shows. The die-cut allows the piece to personify the brand by tying its shape to the tennis ball in their logo. The 8-panel brochure included information on three of their main services (each with its own dedicated panel) as well as an additional panel with some of their smaller services. The piece also includes a mini biography of the company’s founder, on panel focusing on why to choose the company, and the company’s contact information. By dividing the information into these small panels, potential customers can easily find the information they need in order to make a purchasing decision. Its unique shape and bright colors allows this piece to stand out among the clutter of a desk, and provides potential customers with a glimpse of the quality the company provides. By creating a multi-folded and die-cut brochure, we were able to create a piece that is visually interesting, informative and effective. Let us help you innovate your next folding project – request a quote today!